Observed at Sego Safari Lodge, upper Kerio Valley, Kenya. December 2014. This is the male and a female is shown at right. These two were found in close proximity and maybe conspecific. 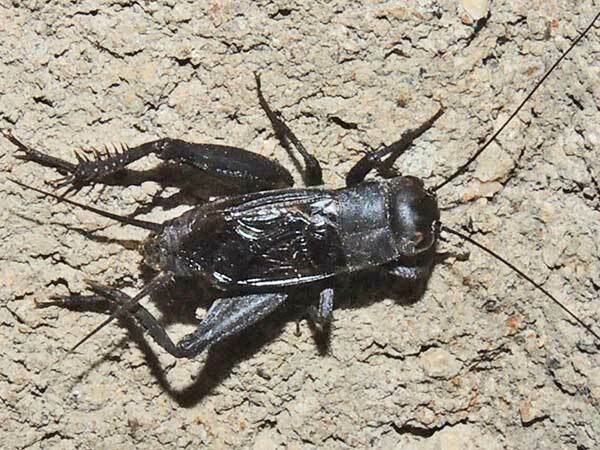 Adult crickets usually have two pairs of wings with the first, top pair, leathery and the second, lower pair, more membranous. The male's larger wings are specially structured to produce and transmit musical vibrations or 'chirps'. Male crickets use their singing to attract a female. Similar Gryllus species may have very distinctly different songs. 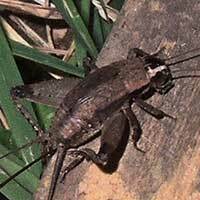 Field crickets are omnivorous feeding on a variety vegetable and carrion. Copyright Michael J. Plagens, page created 4 Nov. 2015.